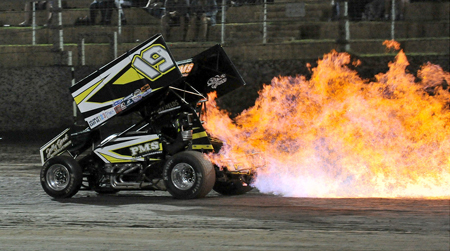 Trent Pigdon joked after his car erupted into flames when round eight of the AHG Sprintcar Series was held at the Perth Motorplex on Boxing Day. But it was no laughing matter moments earlier for the Pigdon Portables pilot who did a great job to get his car as close to the fire crew as possible after it appeared his fuel tank had split. Pigdon was running high on the track coming out of turn four and was avoiding a crash involving Troy Beckingham and Kye Scroop when it appeared he was tagged from behind by Shane Norris. The back of the car very quickly erupted into flames and as Pigdon steered the car along the front straight and to the fire crew he left behind a trail of flames on the track. “That was pretty scary,” Pigdon told the big crowd in the house for the annual Boxing Day Bonanza. It was a disappointing end for Pigdon who started from position seven and showed plenty of speed up until that point. He started from position seven to win the first heat from Ian Loudoun, Brad Maiolo, Callum Williamson, Jason Kendrick, Shane Norris, Russell Taylor and Jason Pryde. And this all with the front wing peeled back in the latter stages. “It was pretty tough out there actually,” Pigdon said immediately after the heat win. “It was good until the front wing came off. Unfortunately he was not able to finish the feature race, bowing out after just 12 laps. Pigdon will be looking to make amends when he contests round nine of the series at Quit Bunbury Speedway this Saturday night.